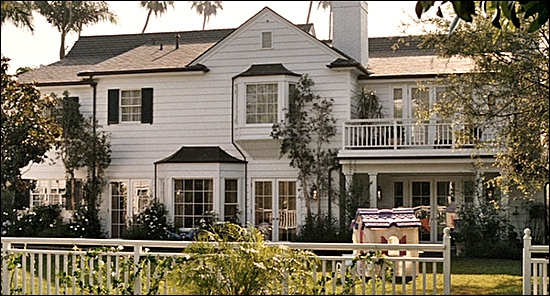 the 2007 movie "Knocked Up" was filmed. what you see is what you get. That handsome home actually is in Brentwood. 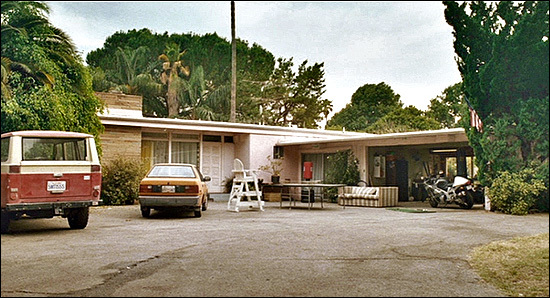 You'll find that house at 531 N. Bristol Avenue, in the Brentwood section of west Los Angeles. That's on the west side of the street, just south of Rockingham Drive. Santa Monica mountains, in the San Fernando Valley. 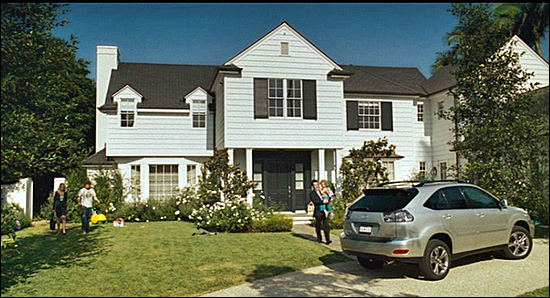 You'll find the house at 17800 Community Street, in Northridge, CA. 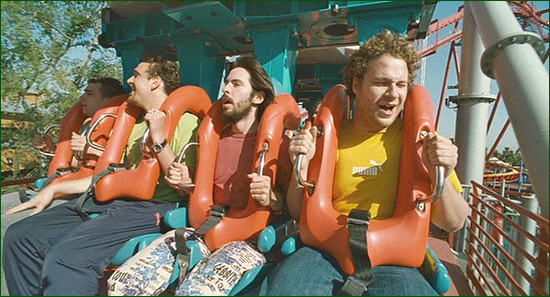 The movie opens with shots of Ben and his gang riding thrill rides at an amusement park. which you'll find at 8039 Beach Blvd, in Buena Park (about 7 miles NE of Disneyland). 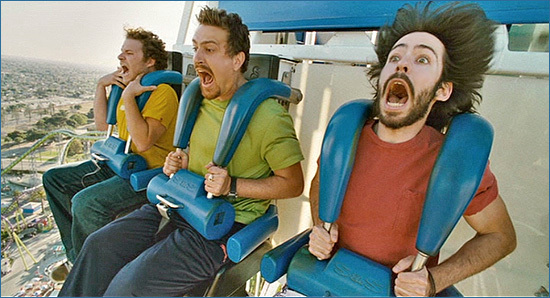 In the photo above, the guys are experiencing the 254-foot drop on Knott's "Supreme Scream" ride. 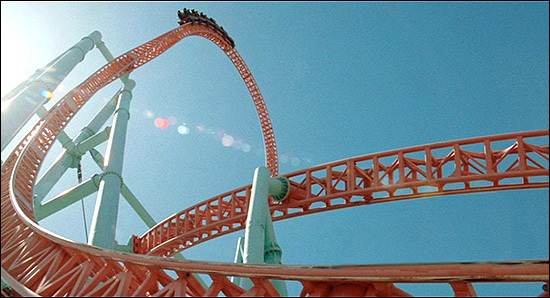 In the photo below, the guys are cresting the killer hill on Knott's "Xcellerator" coaster. Both rides are located in Knott's "Boardwalk" area, in the northwest corner of the park. drive them to head off an argument between her sister and her brother-in-law. Country Club in the background. It was shot near San Vicente & Carmelina Ave.
while the camera looks west/northwest. before the camera herself, as an on-air reporter for E-News. 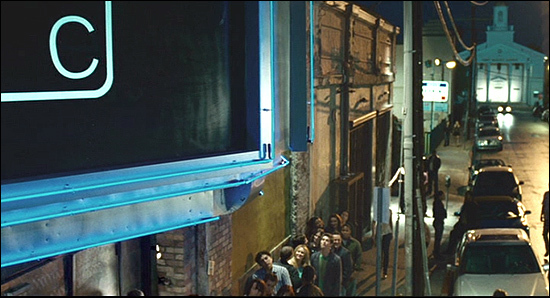 These scenes actually were shot at the E-Entertainment Television Studio. in the Fairfax / Hancock Park section of Los Angeles. 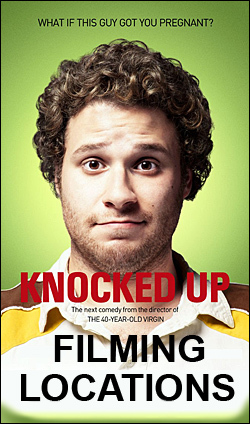 Alison & Ben (Seth Rogen) meet, get drunk and hook up (with unfortunate results). named "Element", which is located at 1642 Las Palmas Ave, in Hollywood. It's on the east side of Las Palmas, just 70 yards south of Hollywood Blvd. However, when they go inside the club, all of a sudden, we've changed locations. in another actual night club. Just not same one (Element) they used for the exterior. north side of Hollywood Blvd, just east of Hollywood Blvd & Cherokee Ave,. Element for the exterior shots and Mood for the interior shots. 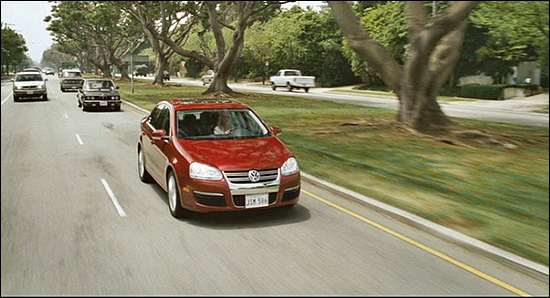 The photos on this page are stills from the DVD of "Knocked Up"